We're about to begin a new year, and with a new year, come new year's resolutions! Eating healthy is always at the top of my list of resolutions. Vega recently reformulated their Vega Sport Performance Protein Powder, and mailed me some to try out. The product is still a completely vegan, plant-based protein powder (mostly pea protein), but they've upped the protein, and added turmeric, tart cherry and probiotics! I recruited my awesome friend Ardara to help come up with a recipe that isn't a protein shake, and she came up with White Chocolate Chip and Cherry No-Bake Vega Protein Cookies! They're dense, and filling, and a little reminiscent of a CLIF bar. They're definitely healthy, but I wanted to see if they would pass a taste test - so I brought them to my office, which has been piled with holiday treats, and my co-workers aren't really into 'healthy' foods, so I felt like it was a good way to measure the tastiness factor. All of my coworkers found the cookies tasty, and several people even went back for more! 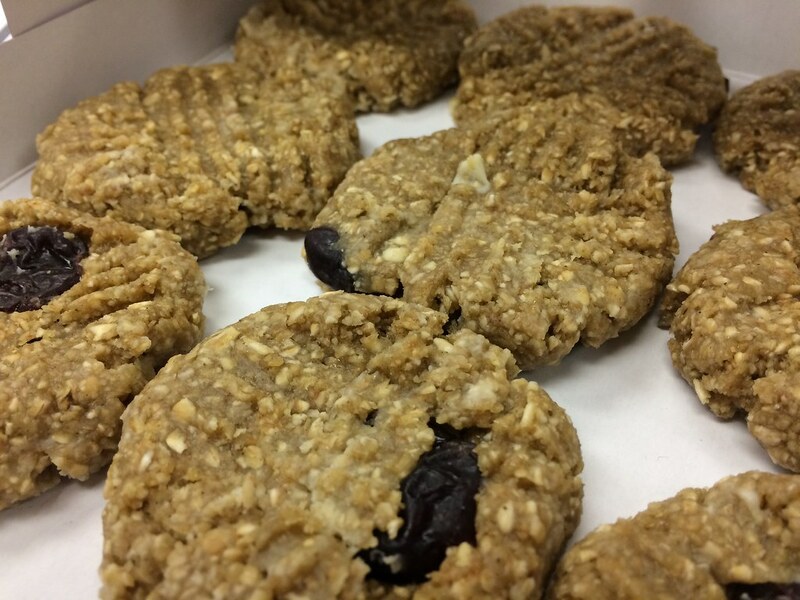 No-bake protein cookies made by Ardara! Photo by Marilyn Tycer. *you can make your own oat flour by rolled oats or old fashioned oats in a blender or in a food processor and pulsing until reaching the desired consistency. Mix oat flour, coconut sugar, and Vega Protein Powder in a large mixing bowl. In a separate microwave-safe bowl, mix peanut butter and brown rice syrup. Microwave for 30 seconds, check, and stir. Continue until completely melted, about 1:30 total. Mix peanut butter/brown rice syrup mixture into dry ingredients. Stir until combined. Add coconut milk and stir until it forms a stiff dough. Mix in white chocolate chips and dried cherries. Roll into 1″ balls (makes approximately 24). Place onto a parchment-lined baking sheet and press flat. Refrigerate 3o minutes until firm. Nutrition facts (per cookie): 175 calories; 7g fat; 24g carbohydrates; 6g protein. Other recipe suggestions: Try substituting the cherries and white chocolate chips with carob chips, peanut butter chips, or dark/milk chocolate chips; chopped nuts; other types of dried fruit (craisins, raisins, coconut flakes, etc). Throw in a little unsweetened cocoa powder (maybe 1 teaspoon). If the pea protein powder taste is too strong, try replacing some of the Vega with PB2 (defatted peanut flour) in a 1:1 ratio. Vega has lots of recipes on their website as well! Marilyn Tycer was born and raised in the PNW. A former fencer for Duke University, Marilyn started running as a hobby in 2009. She was committed after finished a half marathon and they had run out of Jamba Juice--at that moment, Marilyn swore never to be that slow again. She's run every distance between the 5k and the full marathon, and loves to talk about running, especially races! Her other hobbies beer tasting and makeup. She writes her own blog, Lipgloss+Spandex (lipglossandspandex.com), and also writes for We Heart This (weheartthis.com).